Agers Heating & Air Conditioning highly recommends the services of Grasser Electric for all of your electrical improvements and repairs. 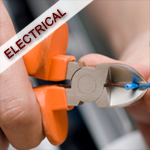 If it's an electrician you need, Grasser is the one you can trust. Give them a call at 636-441-5200.